I am so happy to be sharing my second quilt as-you-go book with you all! 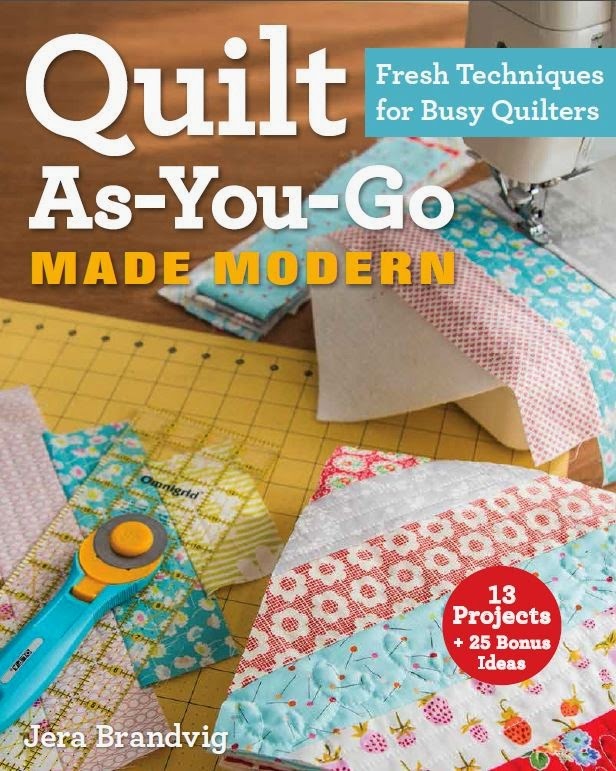 Quilt As-You-Go Made Vintage is a follow up to my first book, Quilt As-You-Go Made Modern. By now I’m sure I sound like a broken record, but this book would not have been possible if not for all of YOU! So a big, warm thank you from my family to yours for all of your support. Also, a loving thank you to my husband, Ben. Thank you for keeping me sane, helping me make time for this book (you can read more on how we did that here), and being there for me through the late nights and rough patches. Without further ado, I am beyond pleased to introduce you to my second book! 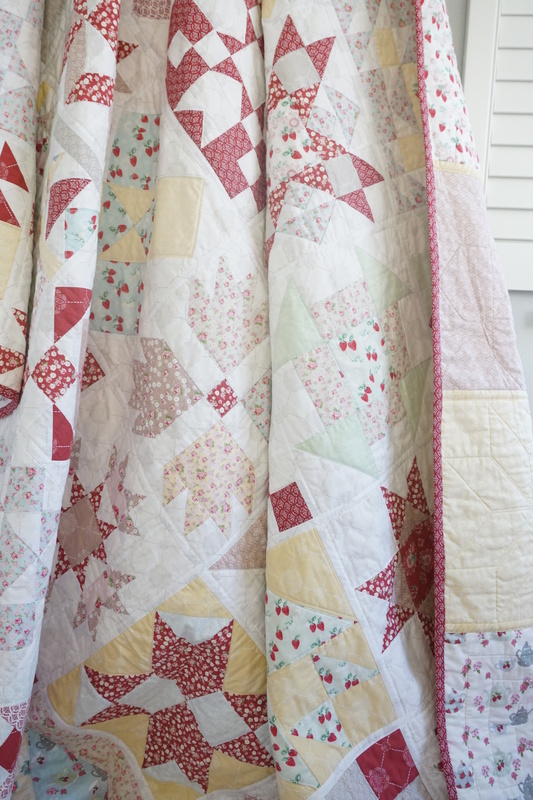 In this post I will share what Quilt As-You-Go Made Vintage all about and how it’s different from the first. I will also share lots of photos of 1 of 9 project quilts in this book. I will continue to share more quilts from my book as the official release date (September 2017) approaches. On a different (and exciting!) 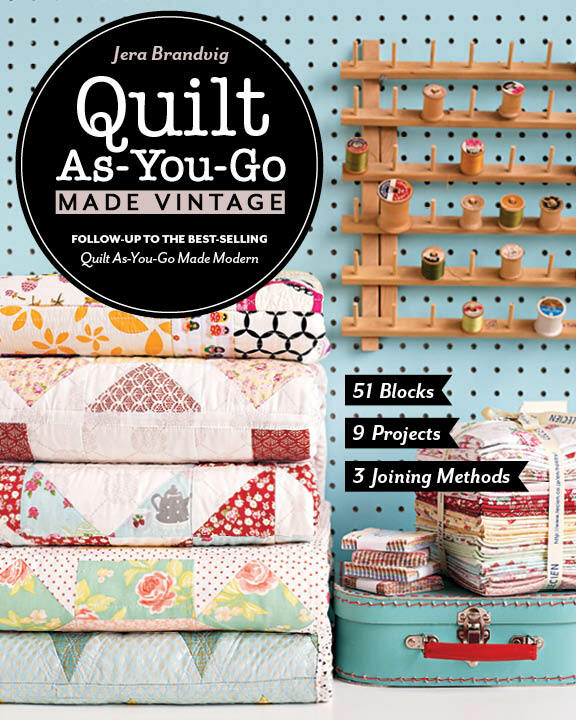 note, I just found out a couple days ago that you can pre-order Quilt As-You-Go Made Vintage on Amazon already! The quilt that I’m sharing today is called the High Tea Sampler quilt. It was made using 48 of the 51 block patterns, all found in my book. Fabrics used are from my first fabric collection, called High Tea for Lecien Fabrics. This quilt was assembled using an all new quilt as-you-go joining technique that was not previously shown in my first book. 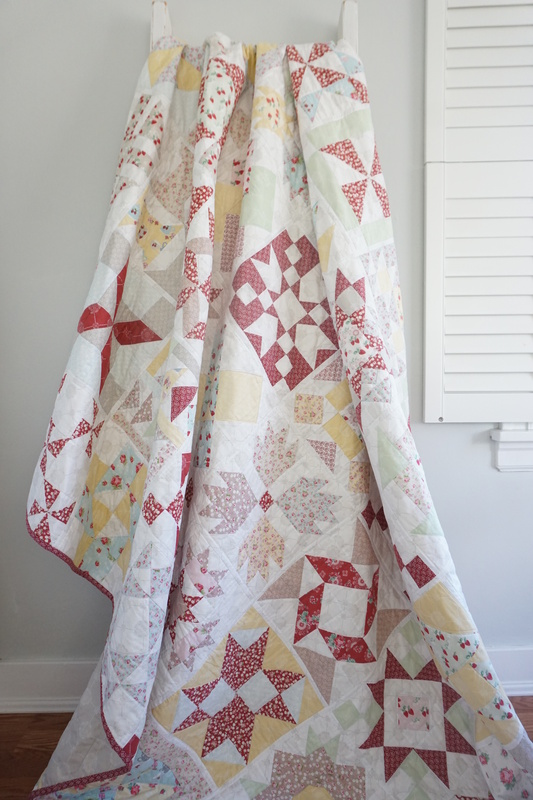 This joining technique essentially creates a reversible quilt. 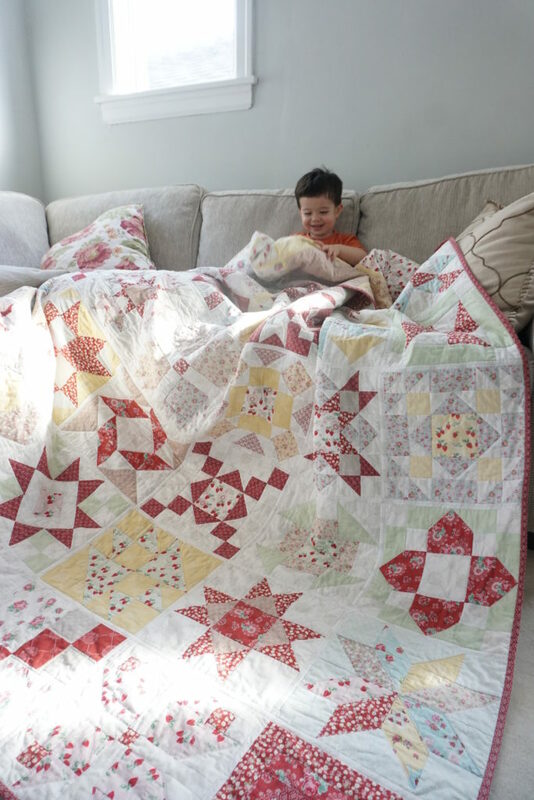 In a nutshell, you quilt the blocks (which measure 12″ squares finished), and then assemble them using joining strips on the front and back of the quilt. This photo shows a glimpse of the front and back of the quilt. This quilt measures 75″ x 100″ – it’s big! 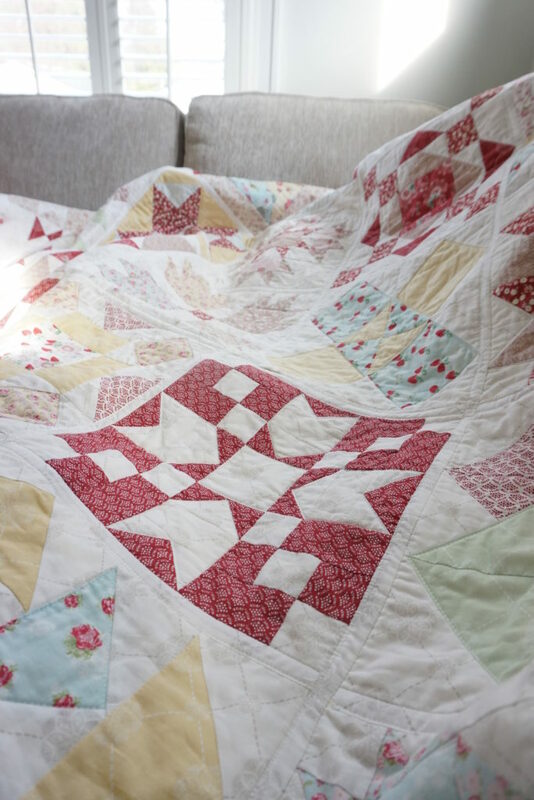 But since you’re quilting 12″ blocks individually, it makes it more manageable to finish a big quilt on your own as you’re not having to run an entire quilt through your machine. Instead, you’re working with 12″ blocks. In the years since Quilt As-You-Go Made Modern released, I’ve become more and more obsessed with classic quilt blocks and vintage quilt patterns. 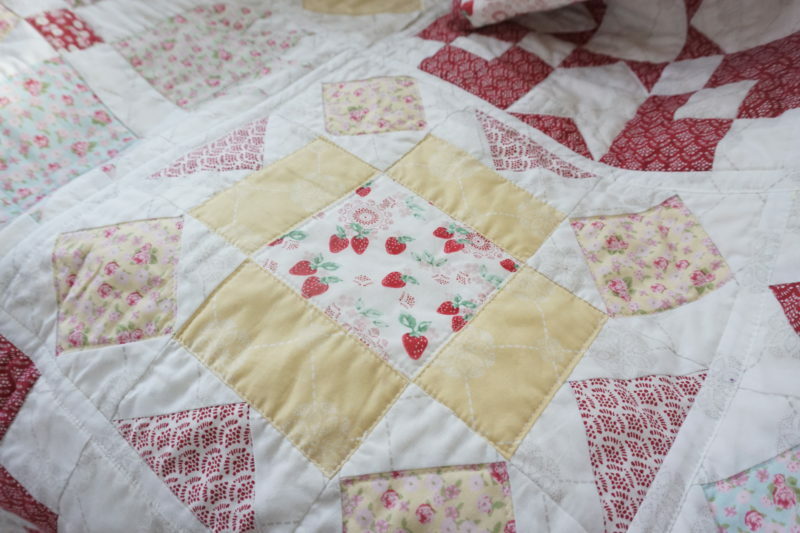 The elegant simplicity of the patterns and delicate details give the quilts a timeless, romantic quality. Since this obsession began, I’ve been working to apply my love of the quilt as-you-go technique to classic quilt designs. The blocks in my book are all pretty simple, but timeless quilt blocks. Hence, the follow up name of my second book, Quilt As-You-Go Made Vintage. 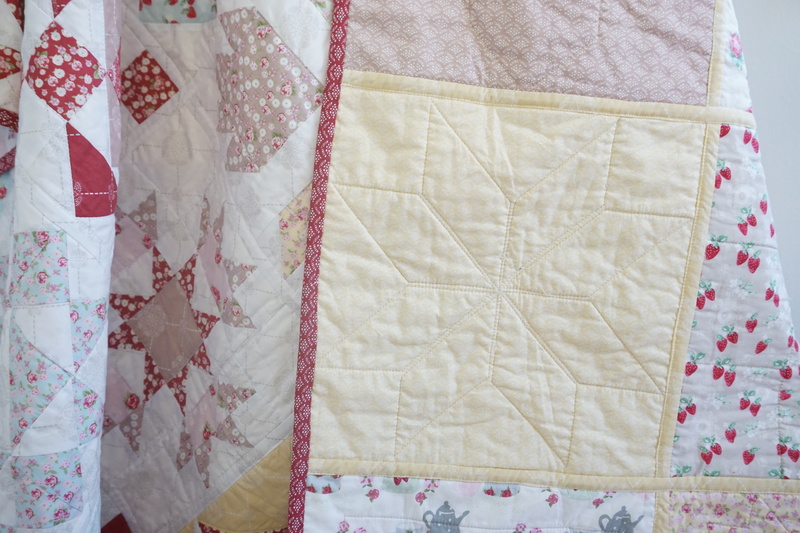 So while my first book had more modern style quilts, this book has a more traditional feel to it. However, with 9 projects and 51 sampler block patterns to choose from, there is still lots of room for creativity! 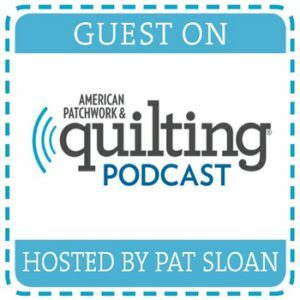 My goals were to keep the technique simple, keep the creative flexibility intact, but open the door to making any block using the quilt as-you-go method. 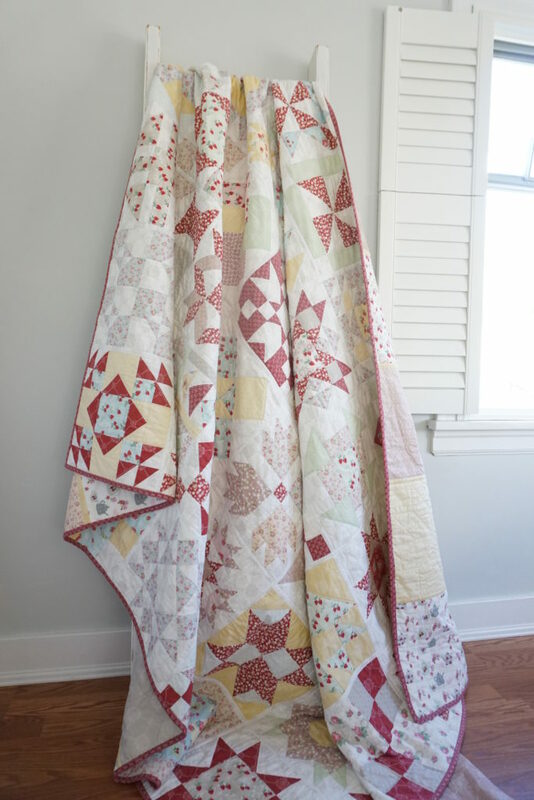 I also wanted to provide a technique to complete a project without putting the assembled quilt through your sewing machine. This book is the culmination of that work. 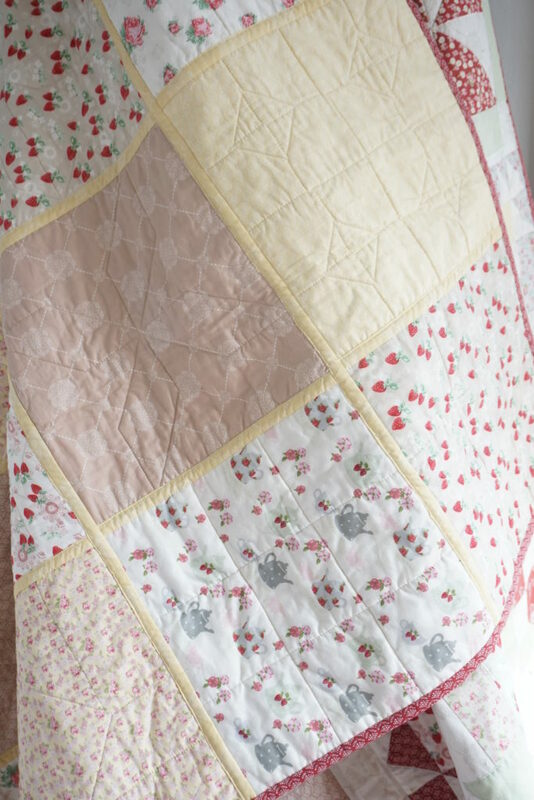 With this book I will show that quilt as-you-go can be used to achieve a traditional and classic style of quilt while still allowing your creativity to show through. In fact, the methods in this book could apply to any block pattern – even those not specifically designed for quilt as-you-go. And as mentioned above, this book introduces a new Quilt-As-you-Go joining technique that doesn’t require the assembled quilt to be put through a machine – not even to attach the backing. And as an added bonus, the new technique results in a beautiful, reversible quilt! This book has 50 different quilt block patterns that measure 12” x 12” finished, as well as 3 different quilt as-you-go finishing techniques to choose from. To give you even more options, you can choose to use the quilt as-you-go finishing techniques or not, as the block patterns can be used to make traditionally finished quilts too. 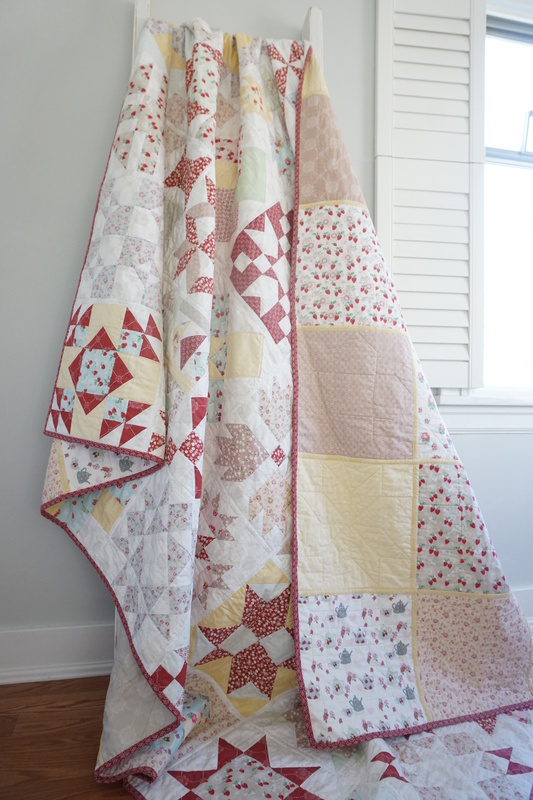 The choice of how to finish your quilt is all yours! In this book I also have a chapter called ‘Quilts for Thought’ to help get your creative juices flowing. My intention for that chapter was to inspire you to create a quilt. I also have a chapter dedicated to choosing fabrics for your quilt. I touch a bit on FMQ as well. Though the patterns in this book are more traditional as compared to my first book, I really strived to make this book a creative (and fun!) experience. Thanks so much for stopping by, and I plan to keep sharing more project quilts from my book with you all! Also, stay tuned for my second fabric collection debut. Fun stuff ahead! Warm hugs! And happy Spring! Meet La Conner, my 2nd collection! 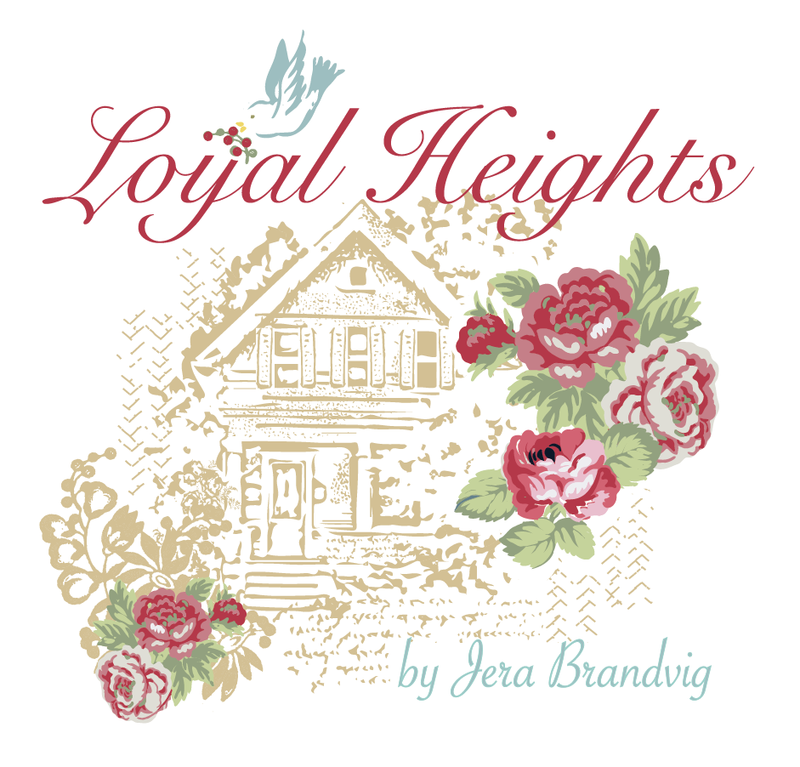 Can’t wait to see more–I love a vintage look sampler too, so this is very exciting to me!! Congratulations on this second book – sounds delightful!! Loved your little peek-a-boo playing son while you took the quilt pictures :)! Congrats. I am a fan of course on all things that have come from you, the first book, the High tea line and I can not wait for new book. I guess I will hold off on using my High Tea purchase until book, but we’ll see. Anyway, loved your first book and high tea fabric line. I am so ready for more both in the book, blog and new fabric line. So thank you for being so dedicated and gifted. I am always going to be a fan. Hi Gina! Wow, I feel so honored getting such a kind message from you. Thank you for taking the time to write. 🙂 I’m happy to hear my work has brought some inspiration for you, it makes it all worth it! Take care, and thanks again for all your support! LOVE this quilt. I must get the book ordered. You have blossomed as a designer and love your innovative ideas. 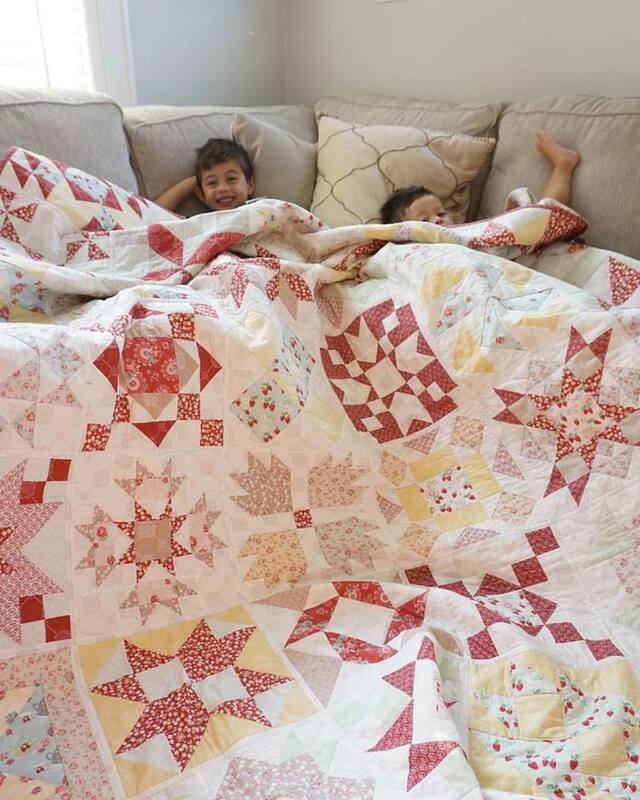 I also love it when your boys and dog are pictured with your quilts! Congratulations! Oh thank you so much for your kind words, Jody! Made my day. 🙂 big hugs from Seattle. I’m so excited! I loved your first book but do tend to lean towards more traditional block patterns and vintage fabrics. Can’t wait foe September! This book looks amazing! And what an ingenious joining technique! I can’t wait to learn and see more! Congratulations on your second! It looks great Can hardly wait to read about this new joining technique. I am a novice quilter & just discovered your book(s) & am very excited to purchase these, and to learn about fabric patterns & colors as well as quilting techniques! This new joining technique sounds intriguing! I’m working on a quilt from your first book right now, using the cuddle fabric for the backing that you mentioned a couple posts ago! That is awesome…I can’t wait. I have a very small sewing maching and cant push anything larger than a smallish lap quilt through it. I have your first book, and I am so excited to learn a new technique that creates the back at the same time! Oh, my word!! 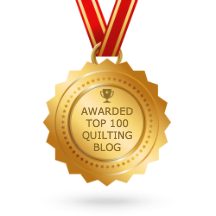 This post came across your blog for the first time from my news feed, (as it has correctly pointed out I seem to be interested in quilting), and I have just found the perfect gift for several family members and a little treat for me- your upcoming book! How exciting! Thanks for that. Woops! I should proof… I meant “I came across your blog for the first time…” Sorry! Now I feel like a dummy. Hehe ? Thank you so much for the kind comment, and I am thrilled that you found me! 🙂 If I’ve succeeded in bringing forth some quilting inspiration to you, then you’ve made my day! 🙂 That’s the whole reason I started my blog…which eventually led to my book, then fabric. Congrats Jerald! So happy for you. Really looking forward to this! Thank you so much for the kind comment! When I was in college I visited La Sarena, Chile as my (now) husband was living there and studying astronomy at the observatories in Chile. It’s a beautiful place! Thank you for ordering it! 🙂 My 2nd book will have a 3rd QAYG joining technique as well. Take care and happy quilting as you go! Question: Do you have a fabric breakdown for your second book (QAYG 2; release date in September 2017)? I would like to go ahead and order your fabric for it. Would I order one of each bundle from your page? I would like to get the fabric now so I know I have it (love your High Tea fabric and “high tea” holds a great deal of significance and meaning to my oldest daughter who I would be making the quilt for)! o	1-2 extra yards of two or three prints that you think you will use consistently in your blocks (for example, I used a lot of red for my blocks so I bought extra yardage of that color). o	Background fabric: 4 yards. On average, you can assemble 3 blocks with 1/4 yard of background fabric. o	Backing: 1 1/4 yard of 6 different prints. Hope this helps! Thank you so much! This might be just what I need. I want to make a quilt for my King size bed. I haven’t made a quilt before. The quilt as you go seems perfect for me. Also, I love the vintage look. I am looking forward to the book. Yay. I cannot wait for this new book!! 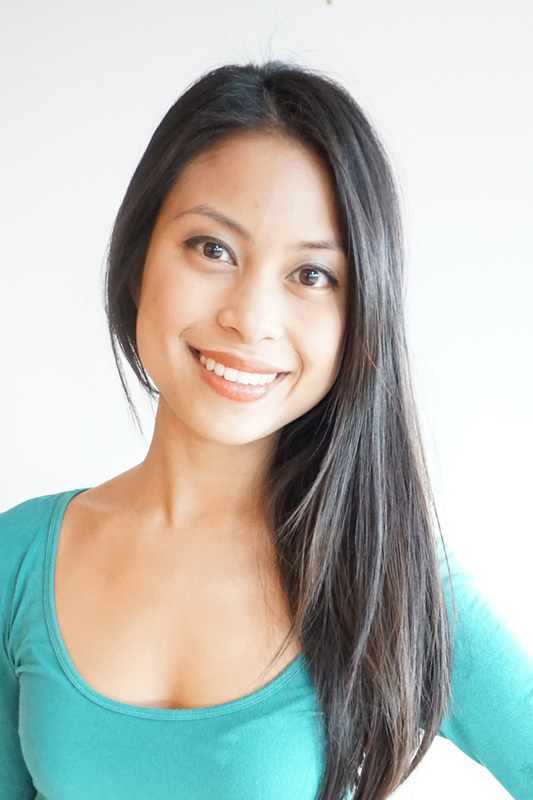 I love the QAYG method, and your last book really helped me to find my creative side! 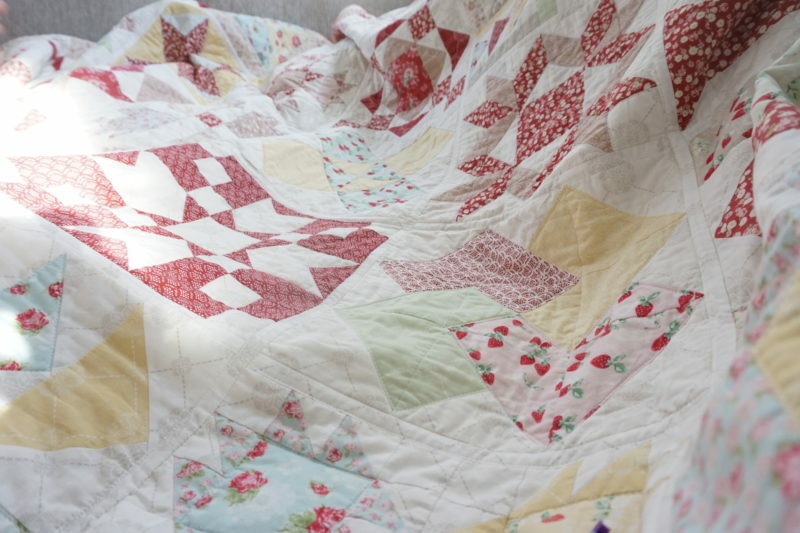 I have made several beautiful quilts now – after reading your book. Your style is very inspirational!! Thanks!! Hi Jera, I love the look of this quilt. 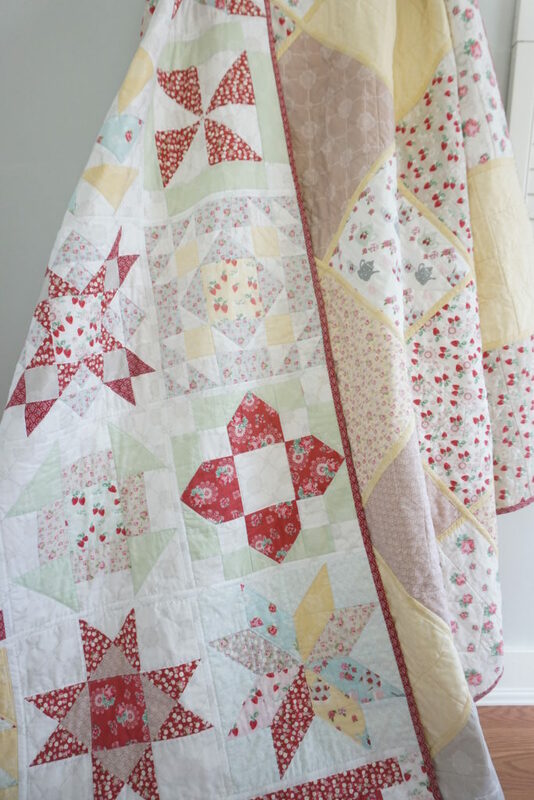 I’ve been a self taught quilter so far and I haven’t done one too big but would love to try one. All I need is to learn how to do them. Lol.. I will be purchasing your books since you explain the techniques so well, even for a newbie like me. Thanks for the info and the great step by step instructions you give. You rock! I’ll be a sure follower for your other blogs! I love all of your patterns and I love the first book. Can not wait until the second one ships to me ! Thank you so much.